Probably the best race I ran. It was perfectly organized, which is amazing for an event that was held for the 1st time, and they already started with the organization of the event next year. We where lucky with the weather. It was overcast and temperatures where hanging around 21 degrees. Currently we have a heat wave in Austria and its been above 30 degrees for the last couple of days, so we where very, very lucky in that sense. The race had two laps, one was 46km and the other one 54km all on the same route, except on the second lap you had to do an extension around Fuschl lake. There where only a few major uphills, that where very steep and no-one was able to run it to the top. The terrain was a bit wet from the previous nights rain, which also caused for some nasty blisters. I started the 1st lap very relaxed, I kept a good pace at 6:12 per km average. When I hit the uphill I would walk it out and downhill I allowed gravity to be my accelerator and then just relaxed, lean forward and stretch the stride. I finished the 1st lap in +/- 5hours. The 2nd lap was tuff though, I refilled my gels, salt tablets etc after the 1st lap and then when I was on route again for about 5km, I hit the wall! I was physically ok, but brain dead. If I closed my eyes I would have fallen asleep. I basically walked then for a few kilometres, refuelled, put some music on tried to motivate me to do the next loop. I was able to fight through it and was able to hit the road again. The second lap was much slower, with much more walking in between. Downhills I did the same strategy; relax, stretch the stride and let gravity do its work. The last 2km I basically only walked. 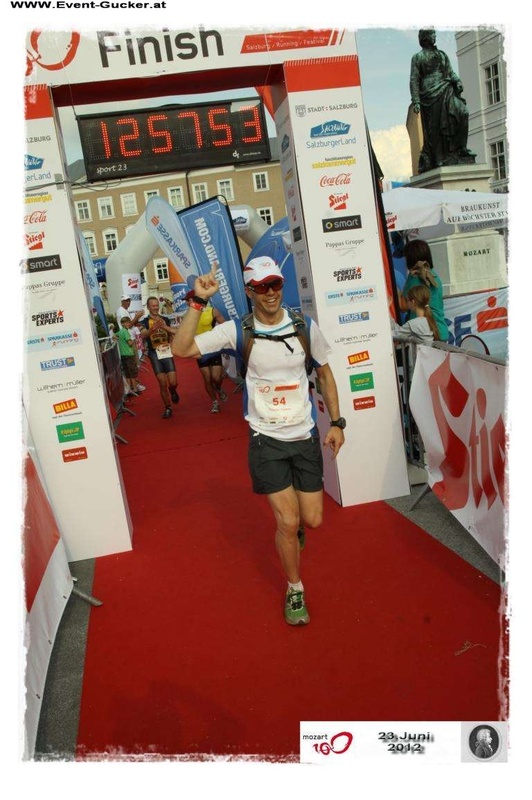 The atmosphere was awesome though and in the city of Salzburg there where lots of people supporting everyone finishing. *) Saltstick is a new product I found, it is a capsule with Sodium, Magnesium and Calcium and some vitamins. This prevents cramps and I also gave some to a guy who was suffering from cramps. *) If you feel brain dead then fill up with Red Bull or Burn. It really wakes you up. I only noticed that on the 2nd lap towards the end, but it helped quite a bit. This entry was posted in Race and tagged bucketlist, marathon, race, ultramarathon. Bookmark the permalink. Wow! I am new to the ultra marathon scene and am always amazed at the distances people can tolerate. Nice job on the race. Very inspiring!